Traveling is amazing. We get to see new places, meet new people and fill our lives with amazing experiences. Even scientists encourage traveling since it boosts our creativity and allows us to reflect on our lives. Some of the best hotels around the world can also provide us with some unforgettable experiences. These hotels are designed to provide its visitors with the most comfortable experience available in today’s world. 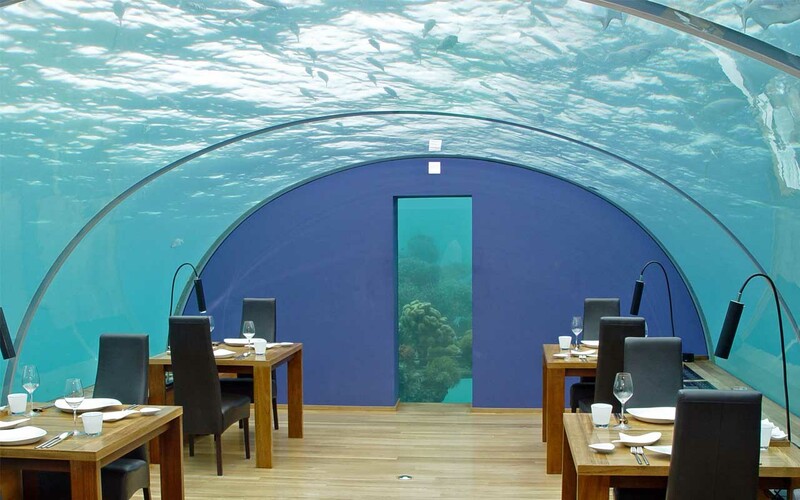 Not only do they have intriguing and attractive rooms, they are placed in some of the most exotic places in the world. Without further ado, here are 10 heavenly hotels you will love and should stay at, at least once in your lifetime. 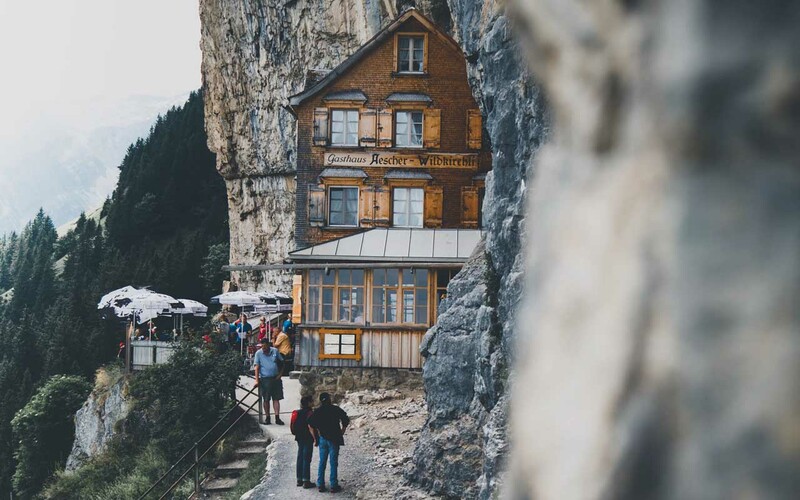 The Äscher Cliff is a restaurant that is located on the side of a mountain. 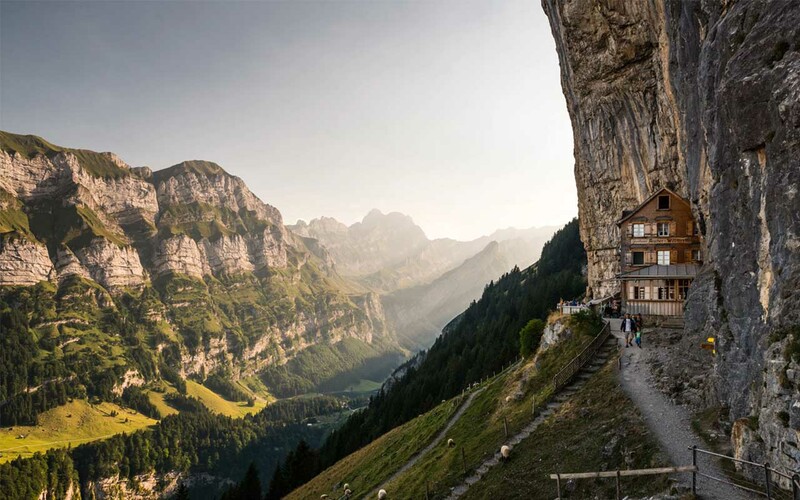 Located 5 km (3.1 miles) above sea level in Switzerland, the restaurant is nestled in the side of a mountain in the Alpstein area and literally clings to the foot of a vertical cliff about 100 meters high. In order to reach the restaurant and enjoy its breathtaking view, visitors have to hike for 3 hours from Wasserauen station and reports online suggest it’s worth the trek, offering spectacular views of this fascinating hiking area. After the first climb, you reach the picturesque Seealp lake, with, behind it, the mighty Säntis mountain. The restaurant is worth the hike since you can enjoy breathtaking views as well as enjoy warm meals and stay at the pristine place. At the end of their visit, travelers can take the cable-car all the way back down to the valley in just a few minutes. 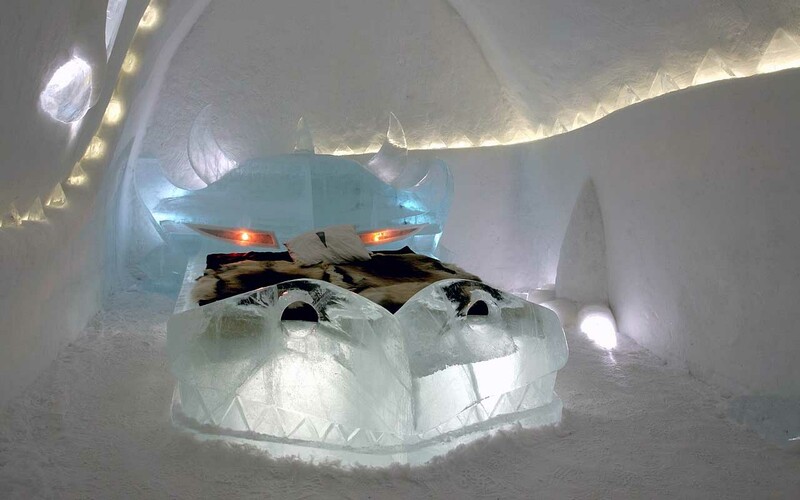 The Ice Hotel in Sweden is a world famous hotel and an art exhibition made of ice and snow. Founded in 1989, the hotel is rebuilt every year during winter, in the Swedish village of Jukkasjärvi – 200 km (124 miles) north of the Arctic Circle. Ice is collected from the Torne River and used to rebuild the hotel by a different artist who provides its visitors with a whole new ice experience. 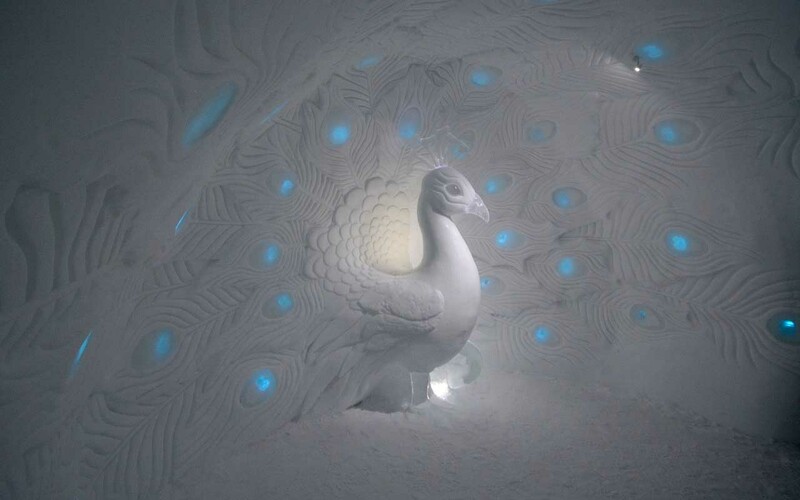 “Icehotel is an art symposium in a class of its own. The energy released here when creative people from a wide variety of backgrounds and places meet the ice is almost tangible,” says Arne Bergh, partner and sculptor who’s been part of Icehotel since the beginning. 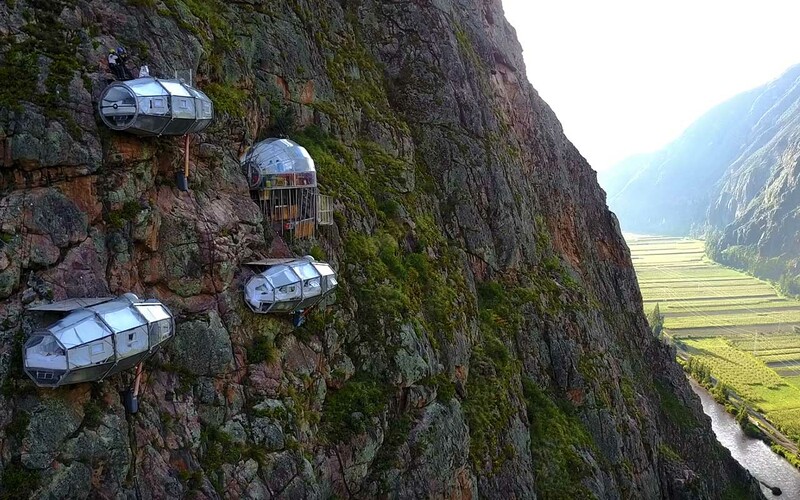 The Skylodge Adventures Suites are precariously situated on the side of a cliff. 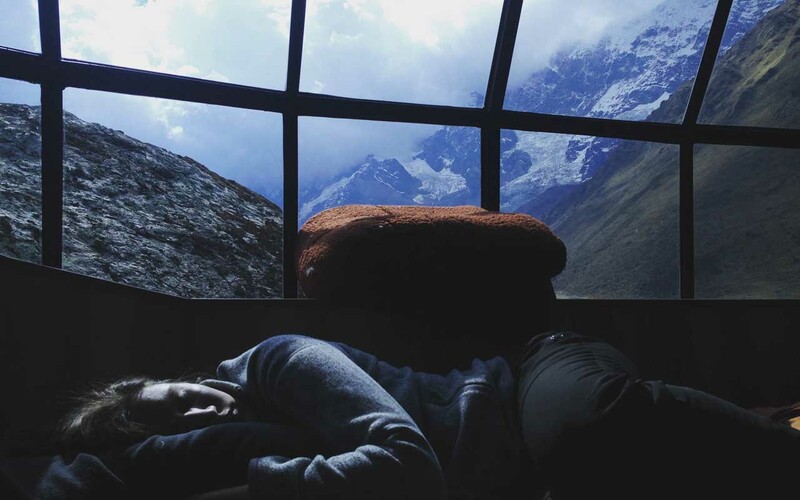 Located in Peru’s Sacred Valley, the pods are accessible only after climbing 400 meters (about 1,300 feet) up the rock face or hiking a daring trail featuring a zip-line network. Once you make the climb, you can enjoy a panoramic view of the wild valley below, and at night, the Milky Way. According to the SkyLodge manager, “The motivation behind these dramatic lodges was to offer a unique experience that [reconnects guests] with nature or make them realize what real luxury can be”. The pods are 24′ x 8′ long and also include four beds, a dining area and a private bathroom. The Conrad Maldives Rangali Island Resort lets you dine with stingrays, and on special occasions, sleep with the sharks. 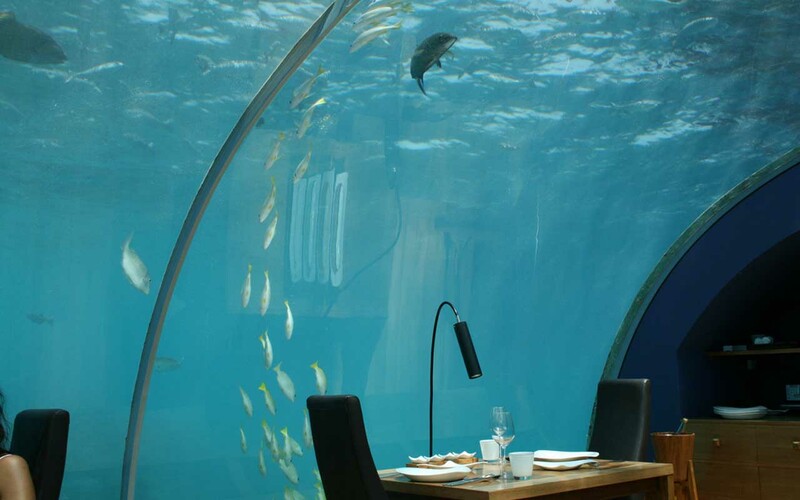 The resort features the world’s first all-glass, under-the-sea restaurant, offering the experience of dining 16 feet (4.9 m) below sea level with 180-degree views of the reef and marine life. Named the Muraka — or “coral” in the Maldives’ local language Dhivehi — it seeks to provide guests who travel here with an “intimate and immersive experience of one of the Earth’s most breathtaking marine environments”. The hotel is also equipped with a gym, a bar, an infinity pool, butler’s quarters, an ocean-facing bathtub and most importantly an underwater bedroom floor with unparalleled views of the ocean. 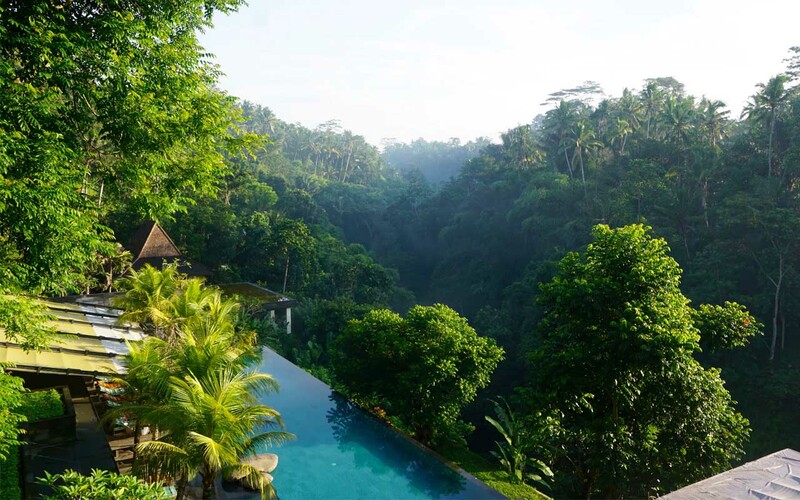 The Hanging Gardens of Bali one of the most breathtakingly designed villa resorts to grace the northern part of the Ayung River Valley in Payangan. Located on the western hillside of the forested valley. One of the biggest specialities the hotel has to offer is the amazing double-tiered infinity pool, that overlooks the lush nature surroundings. On the other side of the valley is an exotic temple that adds to the magical landscape and views. The resort features 36 private pool villas that come in suite, panoramic, riverside, and family options, and feature inspired Balinese villa architecture with a fine combination of organic elements such as granite and bamboo. Located at the edge of the cold, stark Finland wilderness, the Kakslauttanen Arctic Resort is a must place to visit. Built in 1973, the location was accidentally discovered by its founder Jussi Eiramo. While going on a fishing trip, his car broke down and he was forced to set up camp near the isolated roadside woods. Instead of finding it as an inconvenience, the man fell in love with the location and its isolated wilderness. 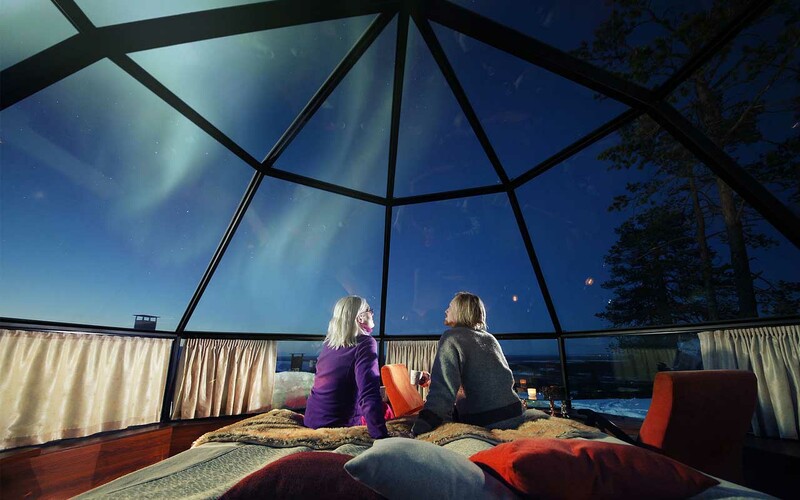 The resort contains different types of glass igloos or ice hotels, where visitors can stay warm and enjoy the breathtaking Northern Lights at night. The compact space and well-sealed panels make it very economical to heat each unit, and the body heat produced by each igloo’s inhabitants reduces energy costs even more. Made up of more than 1,000 islands that sit in 26 reef-framed atolls, Maldives is truly a tourist’s paradise. Filled with waters of seemingly infinite shades of blue and green, white sand, and black corals. 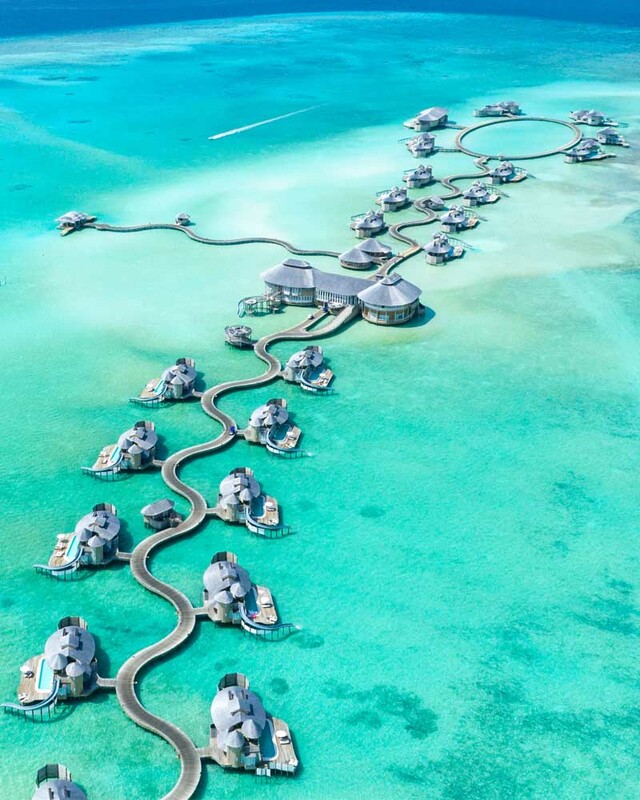 Although there are more than 100 resorts, one of the newest and most expensive resorts in the country is made up of just 24 over-water villas — plus one four-bedroom beach villa. The villas are breathtakingly beautiful but also come with a huge price tag.The smallest available villas range from $3,000-$5,000 per night, depending on the season, while the largest goes for about $20,000 per night. 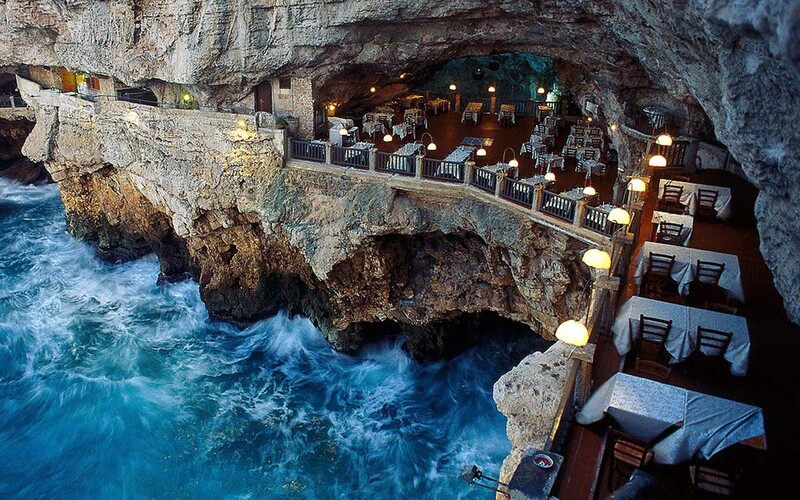 The Grotta Palazzese is a restaurant with a terrace, created inside a natural cave. The restaurant has been operating, hosting parties and banquets since 1700. Visitors can dine just 74 feet above sea level and watch the waves lap the shores just beneath them. The dimly-lit tables are placed close to the edge, to provide visitors with the ultimate experience. The grotta – Italian for ‘cave’ – is part of the Grotta Palazzese hotel, which is located above and built from local stone. However, the Grotta Palazzese restaurant is only open during summer months. If you ever wanted to live inside a bubble, then this is your chance. 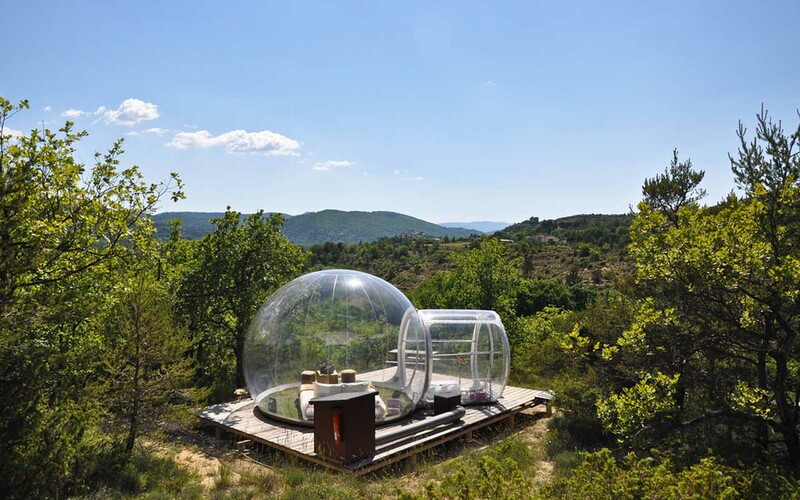 In southeastern France, visitors can sleep inside a transparent, climate-controlled bubble. The Attrap’Rêves Bubble Hotel in Allauch, France, is made of plastic, soundproof pods in a forest environment. Visitors get a 360 degree view of their surroundings and can immerse themselves in the woods while sleeping comfortably in their beds. 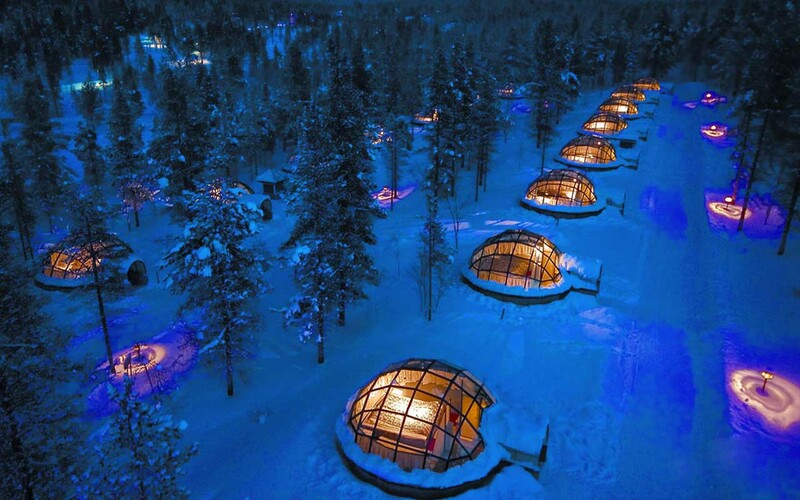 Each bubble is a mere 13 feet in diameter and costs just over $100 per night. It also contains electricity, showers, scenic viewpoints in all directions as well as a wind-blower to keep the bubble inflated. Depending on the amount of privacy you want, there are tinted bubbles that block all views except for the sky, so you can sleep while gazing at the stars. The Marina Bay Sands Hotel in Singapore was built in 2010 but quickly gained popularity to become the most prominent landmark in Singapore. The hotel contains the world’s longest elevated swimming pool- 200 meters above the ground. 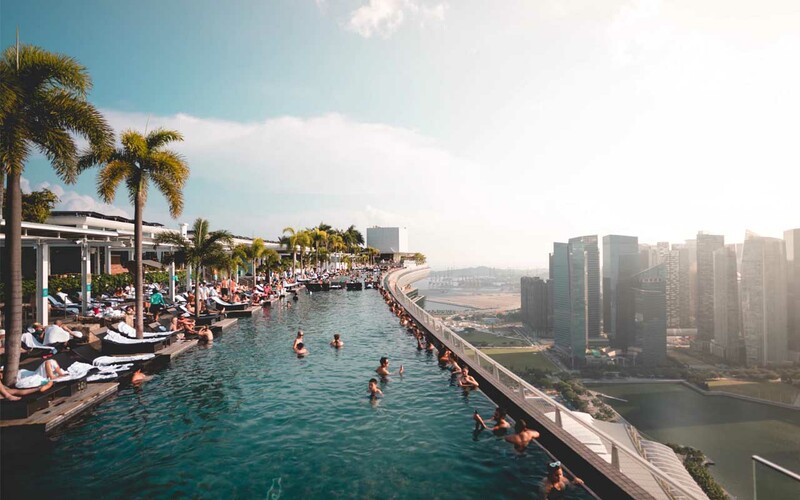 Although Singaporeans were skeptical of the hotel and its creation, it soon became one of the most recognized structures in the world. 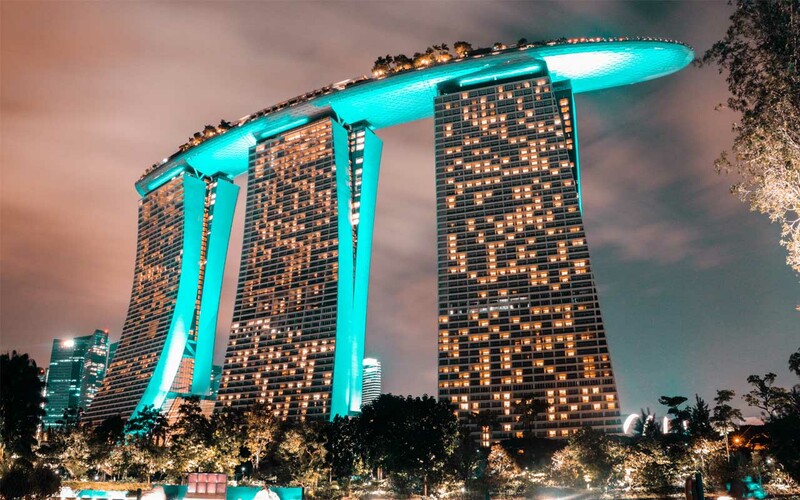 Marina Bay Sands has 2561 rooms and suites, making it one of the top 40 largest hotels in the world. It also has 6 expo halls, 250 meeting rooms and the largest ballroom in Southeast Asia. The swimming pool at the top holds 1423314.83 litres of water. Even if you drink a gallon a day, it would take a millennium to finish it – you’d be drinking well into 3016. Previous McDonald’s Employee With Down Syndrome Retires After Serving Smiles For 32 Years!